Prime minister raps U.N. resolution, refers to "crusade"
Paris (CNN) -- In a rare public spat, Russian President Dmitry Medvedev criticized his political mentor, Prime Minister Vladimir Putin, for Putin's comments over the use of force against Libya. It all started Monday, when Putin visited the town of Votkinsk, where a large defense plant that produces missiles (including nuclear intercontinental ballistic missiles) is located. Criticizing the United Nations Security Council resolution authorizing a no-fly zone over Libya and military action to back it up, Putin called it "obviously incomplete and flawed." Putin said it's clear that "it allows anyone to do anything they want -- to take any actions against a sovereign state." "It resembles a medieval appeal for a crusade in which somebody calls upon somebody to go to a certain place and liberate it," he said. On Thursday, acting on instructions from Medvedev, Russia abstained from the U.N. Security Council resolution imposing a no-fly zone over Libya but did not veto it, something that Putin obviously thought should have happened. 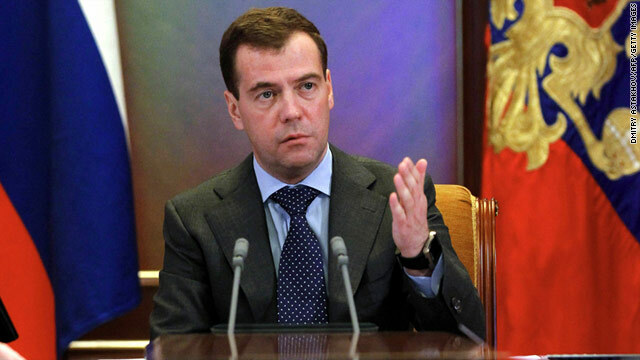 A few hours later Medvedev weighed in, scolding Putin's comments, without using the prime minister's name. "It is absolutely inexcusable to use expressions that, in effect, lead to a clash of civilizations -- such as 'crusades,' and so on. That is unacceptable," he said. Otherwise "everything could end up in far worse shape than it is now. It is important to remember this." Medvedev went on: "All that is now happening in Libya is the result of the appalling behavior of the Libyan leadership and the crimes it committed against its own people." He did not instruct his diplomats to veto the resolution, he said, "for one reason: I do not consider this resolution to be wrong. Moreover, I believe that this resolution generally reflects our understanding of what is going on in Libya." The public smackdown was political catnip in Moscow. The two men, whom Russians refer to as "the tandem," both could be candidates for president in 2012 but neither is announcing yet he will run. Speculation is rife over who might go first -- and when. "In Bill Clinton's times," Putin said, "Yugoslavia and Belgrade were bombed. Bush sent armed forces into Afghanistan. A far-fetched and totally false pretext was used to invade Iraq, and the entire Iraqi leadership was eliminated, even children in Saddam Hussein's family died. "And now, it's Libya's turn -- under the pretext of protecting civilians. But it's the civilian population who dies during those airstrikes against (Libyan) territory. Where is the logic and the conscience? There is neither."